I don’t have much to say about the night’s biggest story on American Idol. The “mentor” is Miley Cyrus? Just so you know, Crystal Bowersox, it’s not normally like this. I have to say that since Crystal apparently never watched the show in the past–and was a surprisingly good sport about the whole thing, even asking Miley to sign her guitar. Hey, things could’ve been worse. The mentor could’ve been Miley’s dad! 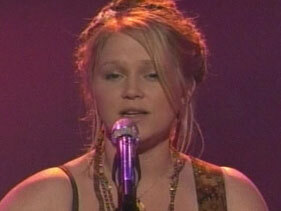 Crystal Bowersox – “Me And Bobby McGee” by Janis Joplin – This performance had everything you’d want from a version of this song: vocal nuances ranging from the subtle to the explosive. Just fantastic, like she always is. It also had something I didn’t want: that guitar in her hands. This would’ve been the perfect song, with its quiet beginning and rocking end, to get out from behind that guitar, and open herself up to the audience, connecting even more. But it sounds like Crystal’s aware of the situation, and we can expect her to do that next week. Leave it to Kara DioGuardi to bring up ditching the guitar; it was really the only note I wrote down during Crystal’s performance. 2) Aaron Kelly – “I Don’t Want To Miss A Thing” by Aerosmith – I’m using the iPod test again to rank the performances (“Do I want this song on my iPod?”). I mean, the search on Idol is for the next big recording artist, right? So what they do on the show should make me wanna buy and listen to their music. Aaron’s got a very recordable voice, and he sounds good live, too. Yes, I think this song was a little “bigger” than his voice (mainly in the second half of the song). But he made this work. 3) Lee DeWyze – “The Letter” by the Box Tops – Simon Cowell said he was surprised Lee chose this song. Yet nobody mentioned the singer of the original, Alex Chilton, a hero to some in the musician world, died in the last week. I can’t confirm that’s the reason Lee picked it; but my guess is that it is. The re-arrangement of Lee’s funky-swing hybrid version didn’t impress me much. It was all over the place. And I actually would not iPod this one for that reason (last week’s “Beast Of Burden” is on there). But vocally, he was on point. And his performance had more energy and personality. He’s stepping up his game in that department–which he needs to. 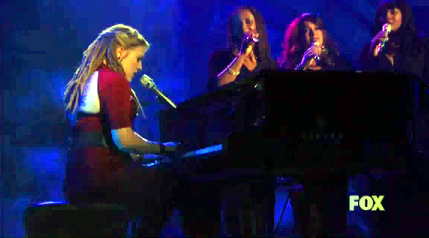 4) Siobhan Magnus – “Superstition” by Stevie Wonder – Not her best vocal. And the “funk” felt a little forced. Then there was that big, screaming note at the end (again). Fun to hear and watch. But also getting predictable. So I’m suggesting Siobhan gets back to chalkboard and looks for some new ways to wow us. That said, based of her look (tonight sporting Sheena Easton’s 80’s hair), attitude, and vocal daredevil antics, she’s the one I’m starting to like the most. I always look forward to seeing what she’s up to. 6) Casey James – “The Power Of Love” by Huey Lewis & The News – Casey continues to define himself as an artist. At the moment, I’m going to say the definition appears to be: a great blues-rock guitarist who can sing pretty well. Vocally, I’d say Casey turned in a 7 on his own scale of 10 last night. Maybe it was the song, but Casey didn’t hold any notes; they mostly felt short and choppy. Even so, there was something fun about his performance. 7) Didi Benami – “You’re No Good” by Linda Ronstadt – Didi’s having a hard time getting used to the big stage and performing in general. I sense that she’s searching for something to do out there on stage. But I’m worried for her she’s heading in the wrong direction. What she did last night felt…uncomfortable. Kind of “Broadway”–the whole “acting out the song” thing. And she lost some of her unique sound “trying on” whatever this new persona was. 8 ) Katie Stevens – “Big Girls Don’t Cry” by Fergie – Kudos for being the only one to pick a song from the last decade. But I’m feeling that there’s a ceiling for Katie. She just can’t seem to hit her notes. As likable as she is, without some sudden improvement, she’s on track to finish somewhere between 8th and 10th place. 9) Tim Urban – “Crazy Little Thing Called Love” by Queen – I wish this song would stop popping up on Idol. There’s really nothing you can do with it–except look like the life of the party at karaoke night. Ironically, this was more in Tim’s vocal range and he sounded OK. But so what? 10) Andrew Garcia – “I Heard It Through The Grapevine” by Marvin Gaye – Not good. This guy has the judges all up inside his head so much he’s lost who he is. Also, having watched him sing without his guitar that last two weeks, I come to a conclusion. I don’t think he sings well without it. When he’s out there sans guitar, he does this odd thing with his vocals where he sings way too carefully, over-enunciating and “punching” certain words–never to the benefit of the performance, very unnatural sounding. He didn’t seem to have this problem with his guitar. Miley’s advice was to lose the guitar. I disagree. 11) Paige Miles – “Against All Odds” by Phil Collins – Great ballad. But she really screwed this one up. She was off-key and flat, and the judges roasted her. “Against All Odds” suddenly describes her situation! So here’s what I’m thinking. The Bottom Three tonight will be: Katie Stevens, Andrew Garcia and Paige Miles. Andrew gets sent to “safety.” And between Katie and Paige, Paige Miles is sent home. Idol Thoughts — Rolling Stones Songs They Oughta Sing…And The Ones They Won’t! Tomorrow night on American Idol, it’s Rolling Stones night! We don’t know yet if the exclamation point is deserved. The Rolling Stones are a rock band. One of the most iconic of all-time. Will their songs translate well to solo performers, all of whom were born in the years well after the Stones most significant music was made? Hard to say. But they have to try. That’s way the Idol game is played. And while we’re taking games, let me take a stab at predicting what Rolling Stones song will be performed tomorrow. And which will definitely not. “As Tears Go By” – My best guess about what’s going on behind-the-scenes is that this is the song Didi Benami and Lacey Brown are fighting over. Maybe a few other singers, too. “Angie” – Why do I feel “Angie” calling Michael Lynche‘s name? “Big Mike” seems like the guy who could genuinely pull off this wistful break-up ballad. If not “Big Mike,” this one needs to be done by a guy with a big voice, like Lee Dewyze. But I worry it could end up in the hands of Tim Urban. And I don’t see that going too well. “Beast Of Burden” – I see a girl taking on this one. Bette Midler covered it. So it seems to be suited for a female voice. Maybe Paige Miles with take on this ‘Burden.’ She’s got some rocker-soul pipes that would sound pretty good on this mid-tempo classic. She went off-track last week with that quiet ballad, “Smile.” Paige needs to get back in her zone. This could be the ticket. 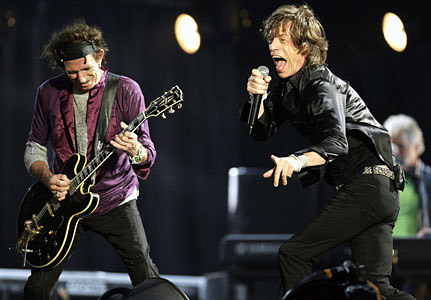 “Fool To Cry” – Not one the the best known Stones songs. But definitely one someone needs to sing tomorrow night. A good one for any of the guys who are dads. Or 16-year old Aaron Kelly, who likes to sing songs from a father’s perspective. That’s a joke, people. Aaron did exactly that last week. I don’t see him doing that again after the heat he took. “You Can’t Always Get What You Want” – Michael Johns sang this song on Idol during Season 7. It’s since been covered memorably on Glee. Among these young finalists, that makes it one of the best know Stones songs. So I see someone tackling this tomorrow night. Probably a female. Maybe Paige Miles. Or Katie Stevens. The more I think about it, I’d say Katie’s the one for this. “Wild Horses” – This song has the potential to be a big “moment” for someone. A good fit for Crystal Bowersox or Casey James. And even for Michael Lynche, if he changes it up and covers it with soul. “Tumbling Dice” – You gotta feel bad for Aaron Kelly, the 16-year old fave of the ‘tweens. What Stones song is going to be right for him? That’s a hard one. If he’s smart, he should find one of their ballads. But if there’s an equal chance he’ll go this route: a “get-the-crowd-rockin'” track like “Tumbling Dice.” Although I’d rather hear the big voice of Siobhan Magnus tackle this one. It’d also be a solid choice for Paige Miles, whose well-suited for it. “Gimme Shelter” – If Lee Dewyze wants to define his mission as a rocker, I say this is the song he needs to sing tomorrow night. Lots of potential here to make it his own. “Ruby Tuesday” – A “no-brainer.” The only question is who will sing it? Someone like Didi Benami, who has the potential to transform it and have a transcendent moment? Or Aaron Kelly, who’ll sound nice on what feels like a karaoke moment? “Play With Fire” – I haven’t figured out who will sing this. I just strongly think someone should! Maybe Lacey Brown or Casey James if their first choices fall through. “Time Is On My Side” – It’s another solid nugget from the Stones catalog. I say it’s harder to sing than it seems. So whoever snags this one better bring their A-Game. The song’s going to need someone who can make it their own. Lee Dewyze or Siobhan Magnus. “Waiting On A Friend” – I’m feelin’ someone will do this tomorrow night. I’m also feelin’ it will be the low-light of the night. “Anybody Seen My Baby?” – One of the few Stones hits actually released during the lifetimes of the Idol finalists. This is the song whose chorus sounds similar to k.d. lang‘s “Constant Craving.” So much so, they gave her a songwriting credit. Smart move. The Stones would’ve lost that lawsuit! Because it came out in 1997, maybe it’s only Stones song one of the finalist knows and they decide to go with it. “(I Can’t Get No) Satisfaction” – Probably the best know Stones song. Iconic. And I say somewhat untouchable. Yes, Adam Lambert sang it last season. Adam had the Jagger-swagger to pull it off. No one from this season’s Top 12 has the over-the-top persona to make this one fly. Unless Siobhan Magnus takes a shot at it. Recasting this one as a 2010 chick anthem would be risky–but definitely memorable! “Sympathy For The Devil” – Snowball, you’re in Hell…how you like your chances? It may be a staple on Classic Rock radio stations. But we won’t be hearing this one on America’s number one television show. “Start Me Up” – I gotta put this song down here because I’m saying…don’t! Don’t do this song. Yes, it’s one of the best known Stones songs. But it’s a poor choice if you want to show off your vocal range. And, more importantly, there’s no way to perform it without descending into a parody that will probably earn you a first-class ticket home. The exception is this: an Andrew Garcia acoustic re-imagining of the song. Which is less far-fetched than it sounds. “Jumpin’ Jack Flash” — See paragraph above. “Under My Thumb” – The Stones are known as the bad boys of rock ‘n’ roll. Songs like this one with its borderline misogynistic boast are partly how they got that reputation. Sing this song and then try and get women to vote for you? I don’t see that happening. “Star Star” – This one’s a gimme. Anybody that knows its lyrical content knows there’s not a chance it’s going to be performed on Idol. “Brown Sugar” – No way. But I have to ask, “What if?” What if something crazy and borderline inappropriate actually happened on Idol one night? Would that be so bad? Well, that’s what I’m thinking today as I listen to all these Rolling Stones songs on LaLa. What do you think? Leave a comment. It’s funny how often the Top 12 on American Idol seems like it was determined by central casting. Take last night, for example. Based on their performances, this week and recently, if you had to pin me down on an exact prediction, I would’ve said Paige Miles and Katie Stevens would have been sent home last night. Paige and Katie made the Top 12. And…the Top 12 is actually better for it. It’s the most diverse line-up of females in the Top 12 it could be under the circumstances. One problem the show’s been having this season is that there were too many similar-sounding female singers. Last night was like weeding your garden; you give the remaining sensitive girl singer-songwriter contestants a better chance to flourish by eliminating the ones who are similar, but less likely to survive. Funny how Idol viewers voted to cast the Top 12 exactly how Idol producers would have cast it themselves. Funny how it works out that way. The four sent home last night: Katelyn Epperley, Todrick Hall, Alex Lambert and Lilly Scott. The Top 12: Crystal Bowersox, Michael Lynche (“Big Mike), Siobhan Magnus, Lee Dewyze, Didi Benami, Casey James, Lacey Brown, Aaron Kelly, Paige Miles, Andrew Garcia, Katie Stevens and Tim Urban. As I said, I would’ve been 0-2 on predicting which girls were leaving. As for the guys, I would’ve nailed that. I suspected Aaron had the votes, being the cute young guy the ‘tween girls are going to support. Tim’s been improving, and has a similar appeal to Aaron. So they were safe. I wasn’t impressed by Todrick’s vocals and have been saying so for weeks. Clearly, it had to be the end of the road for him. And Alex was simply the odd man out on this one. Just no room in the Top 12 for him. Too bad for Alex; he has a great voice. Alex is going home because he was uncomfortable on stage. Plain and simple. If he’d even shown a glimmer of improvement in that area, he’d be listening to Rolling Stones songs right now, deciding what to sing next week. Finally, we saw the welcome return of last season’s Matt Giraud and the…umm…return of Scott MacIntyre. They duetted on Billy Joel’s “Tell Her About It.” To which, I asked, “Why? ?” Matt sounded great. Scott…well, I’m not a fan. So I literally gave it one-handed applause when they were done. I’m not making that up.